Morris Engel’s Little Fugitive (1953) is a remarkably simple film: Joey, a seven-year-old boy living in Brooklyn, is left under the watch of his brother, Lennie, while their mother takes a quick trip to visit their ailing grandmother. Lennie plays a practical joke on Joey, in which Joey is made to believe he’s accidentally killed Lennie. So what does Joey do? He runs away to Coney Island, of course! From that point on, the movie is as much documentary as narrative. With seeming murder behind him and life on the lam ahead of him, Joey takes on Coney Island as any seven-year-old would: he goes on the merry-go-round, plays games, rides ponies, and does some good, old-fashioned loitering. Effectively, the bulk of the movie is footage of a cute, seven-year-old kid having a really awesome time (aside from that whole killing his older brother thing). And yet, despite the simplicity, there isn’t a single boring second. Today, Little Fugitive is mostly remembered for its pioneering use of hand-held 35 mm cameras, which allowed Engel to film on-location discreetly and without the need for a large crew. With such cameras, Engel was able capture bustling Coney Island crowds while being virtually unnoticed by passersby–one of several techniques that would have a huge influence on French New Wave directors such as Francois Truffaut, but also on American independent filmmakers like John Cassavetes. As a result of this technique, too, there’s an almost voyeuristic quality to watching the movie; many of the people shown on camera had no idea they were being filmed, so we get to see them going about their day as naturally as possible. Likewise, the non-professional actor Richie Andrusco, who stars as Joey, doesn’t seem to be acting so much as enjoying himself. The effect is, cheesy-sounding or no, a little magical. In all, the viewer really does get to see Coney Island from the perspective of a little kid, and to savor his thrilling (if sometimes scary) experiences throughout a day of filming by the shore to boot. Now removed by over 60 years, the movie is perhaps even more fascinating today than it was upon its initial release thanks to its time capsule-like qualities. 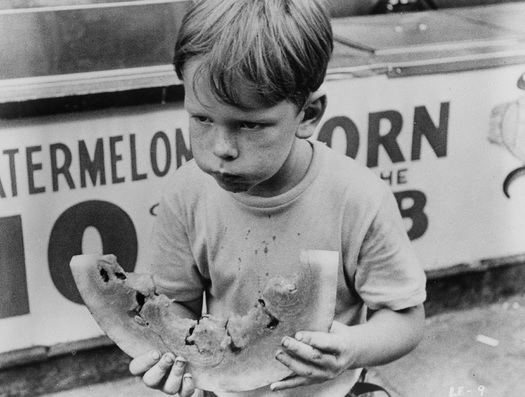 While watching Joey’s adventures will likely always be a joy for adult viewers, Little Fugitive now also stands as a video-document of a Coney Island that has long since faded into memory. Coney Island was in fact already in decline from its heyday by the time Engel’s discreet cameras began rolling in 1953: of the original three amusement parks located there, only Steeplechase Park, where the movie was filmed, remained open. Engel was lucky to have shot when he did, as Steeplechase’s business would continue withering over the next decade, finally causing the park to close permanently in 1964 (those viewers up on their New York City history might find the loss of the park even more depressing due to the fact that the land the it sat on was sold to Fred Trump, father of a current front-page political loiterer, who would bulldoze everything in 1966). 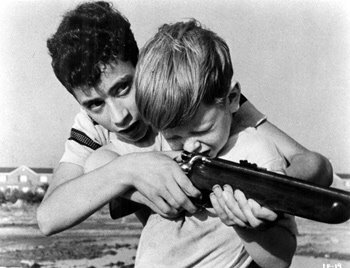 The decline of Coney Island and its amusement parks make Little Fugitive all the more important as a historical document, but the most vital purpose the film serves is letting audiences experience these long-lost locales from the vantage point of a boy who’s having the time of his life. In many ways, watching it is the cinematic equivalent of grabbing a drink with an old New Yorker and listening to stories from their childhood. When somebody who grew up in the 1940s or 1950s mutters an oft-repeated phrase like, “things were simpler then,” maybe they’re referring, at least in part, to the kind of world depicted in the movie—one in which a seven-year-old boy could wander around by himself safely and pretty much unnoticed. Indeed, one of the most striking things about the film is that there’s never any sense of danger; we recognize that a little boy shouldn’t be out on his own, but we’re never actually worried about anybody hurting him. Joey’s world is exists before the “stranger danger” era, and even the adults with whom Joey interacts don’t seem to bat a single eyelash at seeing a kid out on his own. These days, we’d likely be shocked to see such a small boy riding the train by himself, let alone wandering the beach unaccompanied. 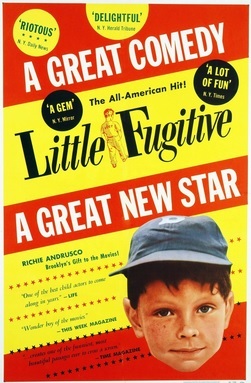 Of course, 1950s America was not nearly as innocent as depicted in the movie, but Little Fugitive aligns near-perfectly with a romanticized version of the era–one in which, from a child’s perspective, everything can be horse rides and watermelon slices by the sea. From a modern perspective, too, the film is almost humorous in how much it resembles an exaggerated version of 1950s Brooklyn. Joey and his brother talk just as you’d imagine, from their almost curiously strong accents to their heavy use of words like “fella.” Joey’s obsession with cowboys is also very much of the time, when TV- and Silver Screen-Westerns dominated much of kids’ imaginations; to wit, the only thing he brings with him on his trip is a toy revolver (that a kid could repeatedly pull out a toy that looks so much like a real gun is a dating detail, too). 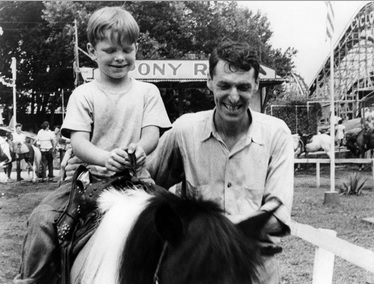 His favorite attraction at Coney Island is, naturally, the pony ride, which he visits repeatedly. And when Joey finally makes it home, he’s mostly just relieved that he made it back in time to watch his favorite cowboy program on television. In all, there are few movies that so effortlessly and vividly transport a viewer back to a certain time and place. It’s no wonder, too, that Engel was originally a photographer, having shot such sights as the landing at Normandy on D-Day; similarly to many photographic records of the era, Little Fugitive seems to have been made for the sole purpose of capturing a moment in time. The premise, as minimal as it is, is nothing more than a device to explain why Joey is all alone at the beach. Perhaps Engel realized that the Coney Island of his youth was quickly disappearing and wanted to put it on film, preserving the feeling of spending a hot summer day there and taking in all it had to offer. Or maybe he wanted one more such day for himself, and was only able to relive a moment of pure childhood from behind the camera. Whatever Engel’s motivations were, we should appreciate the movie for its huge influence on independent filmmaking, of course, but also recognize it for what it really is: a (really adorable) time machine.